Noon: Arrived at Denpasar then straight go to Kuta via Pia Legong Store. This is the famous Balinese snack called Pia stuffed with cheese or chocolate. It is very difficult to get it since it’s so famous and tastes so good, that you have to order at least 1 week before. But it is worth for waiting. A box of 10 pia costs Rp. 50,000 and you can choose whether you want a box of chocolate pia or cheese pia or mix of both. Nite: Having dinner at Warung 96, I heard the pizza is good but I ordered Spaghetti Bolognaise and Banana Juice. A weird combination though, but I love Banana 😉 The juice tastes good although the spaghetti is not really well-cooked. The salad tastes great also and the price is very affordable comparing to the same kind of restaurant and food in Jakarta. After dinner, I hit the Bounty Club in Legian Street. I love this place, the music is good and you can see many cute foreigners dancing around :p What a day! So now, the agenda is mostly to get tattoo and survey the cheap hotel in Poppies 1. So I went to Kuta beach for temporary tattoo and got 2 tattoos for Rp. 40,000. Then I went to poppies 1 to check on the budget hotels there, such as AP INN, Fat Yogi, Suji Bungalow, Sorga Hotel. And I found a hotel that interest me, called Sari Jaya Cottage. Well, at least, I like the pool. I look up in the internet and the price is affordable. Maybe I will try staying there next time. Lunch: Warung Nulan (sry, forgot the real name). It is located in the street which connected the poppies lane 2 and jalan benesari. It is easier to get there from poppies lane 2. The food is not bad and the price is affordable. I ate rice, egg, vegetable, potato with sambal for Rp. 10,000. Dinner: Warung Made in Jl. Pantai Kuta. You should go early if you want to get a table here. I ordered combination of Nasi Campur (rice, chicken, etc) and Gado-gado (mix veggie) and a glass of beer. Nasi Campur & gado-gado combi tastes so so and then I’d like to try Arak Bali so I ordered a single glass.. Hm.. I heard that Arak Bali tastes sweet cause I don’t really like bitter drink, but apparently I was wrong. It tastes really bitter so I ordered French Fries to cover it but … Well, it is a very strong drink for me, kinda make me a little fly eventhough on full stomach. Today, my solo journey is finally started. In the morning, I went to Candidasa by Perama Bus. Why Candidasa? Because the hotel’s pool looks really good on the web :p. Well, for me, my voyage should involve **a good price of budget hotel** with **nice swimming pool** and has a **nice beach** and **nite life** nearby. Beside that, they have diving class which only offer 1 session at pool and 1 session at sea for about Rp.580k. Usually diving lessons include 1 session at pool and 2 session at sea, in which I doubt to take it because it’s my first time for diving. I didn’t even know if I could make it to sea session. Anyway, going to Candidasa by Perama bus takes about 4 hours with 2 stops in Ubud and Padang Bay. Nite: I ate at hotel resto, it’s Italian cuisine.. I chose pasta seafood (forget the name) but the taste was .. too salty.. I went to Karangasem to go to ATM coz I sort of money since apparently I will need to extend my stay for diving lesson and there is no ATM nearby in Candidasa.. So either you go to Padang Bay or Karangasem. I chose to go to Karangasem, which is about 30-45min drive from hotel. so I rented a car with a driver for Rp. 100,000. Near the ATM, there is this big supermarket (forgot the name, maybe Hardy’s) where you can shop everything. Ow.. I visited Ujung on the way also.. it looks like an old palace surrounded by water garden. Then afternoon, I started the diving lesson.. I almost failed at first but finally got through the pool session and so happy to start the sea session next day. 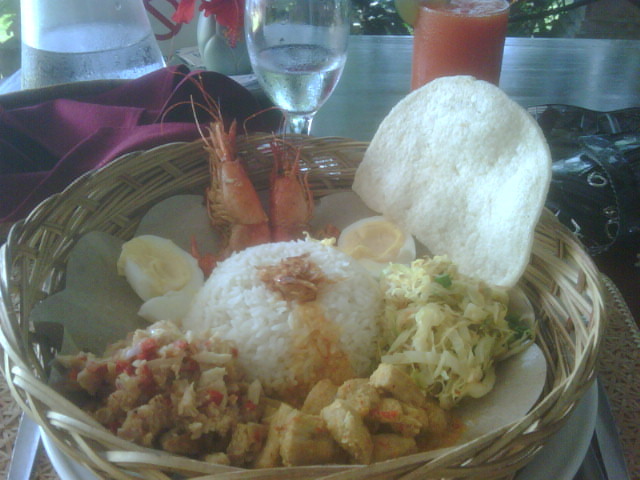 Lunch: hotel resto, this time I ordered Nasi Campur and you know, it tasted so DELICIOUS!! I paid the same price with pasta I ordered last nite for around Rp. 60,000 and I didn’t regret it at all. Depart in the morning to Tulamben. The scenery on the road was so beautiful.. mountain.. all green.. paddy field.. love it! It takes about 1 hour to reach Tulamben. It was my first time there and I though it was a white sand beach. But apparently the same beach like in Candidasa, full with rocks. Well, the diving lesson went well. I took 2 dives instead of 1 dive, with extra charge of course :p Tulamben underwater is so beautiful. I love to return back there.. but I think I should take Open Water License first .. Anyway, I stayed in Hotel Lusa in Benesari Street. This hotel is only short walk to Kuta Beach but 15-20 min to Legian clubs. I got a very big room with AC for only Rp. 210k. It has a nice pool and wi-fi is good. Lunch: Warung Indonesia, located in Gang Ronta, Poppies Lane 2. If you enter Poppie Lane 2 from Bomb Monument, this alley will be 5-10 meter on your left and then just walk about 10 m.. It is on your right. The food is local food with very very cheap price. Nite: Dinner at Warung 96 again, I ordered the house pizza and it tastes delicious. Also the Banana Juice -again- and Salad. All costs only for Rp. 75,000 and since I ate with my friend, so I only paid half. Cheap isn’t it? Then… nite entertainment started. We went to Bounty Club dancing.. till morning.. I love it there!! Going to Dreamland Beach….. Got hangover from clubbing so I only slept there on rental bench while getting tanned.. Anyway, we went there with rental car for Rp. 300,000 for 5 hours include gasoline, driver, parking, New Avanza Car. The driver is very friendly and found him near Kuta Beach. Many people usually offer your rental car in there. If you’d like his number, just email me. Lunch: in local resto in Dreamland.. expensive and Nasi Goreng didn’t taste good. Then going to Klapa Café above the beach. There is pool where you can swim there and the place where you can enjoy sunset. I visited to this café 8 months ago and the place and services was so great.. but this time, somehow the service and the place doesn’t look as good as before. Nite: Dinner at Mojo Burrito’s.. it’s in mid of the street which connected poppies lane 2 and Benesari street. It tastes great, also the ‘green’ drink I ordered.. Burrito and the drink cost about Rp. 45,000 which is very cheap comparing to that kind of food and taste in Jakarta. Then we planned to go to Sky Garden Club at Legian, already dressed up but unfortunately, I fell a sleep when waiting for the time.. so stupid..
Then in the afternoon, I finally go to aiport via Pia Legong to take my order and buy some Bali snack: Dodol Salak Bali and my fave, Kacang Koro in airport shop.. Despite that, I really like solo traveling to Bali and surely I am gonna go back there again sooner or later. You got a very nice Blog and I love to read it. Makes me feel happy and you give me great inspiration for my trip to Bali on 28 of may. Life in Bali is so much better then here (The Netherlands) So I can’t wait to go there. Thanks again for you’re writing.